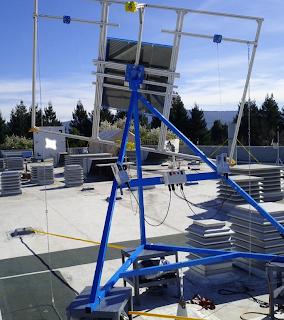 Google’s RE<C renewable energy research project has recently open sourced a new tool and a significant amount of data to support future CSP (concentrating solar power) heliostat development. HOpS, heliostat optical simulation, is an open source software tool for accurately and efficiently performing optical simulations of fields of heliostats, the actuated mirror assemblies that direct sunlight onto a target in CSP applications. 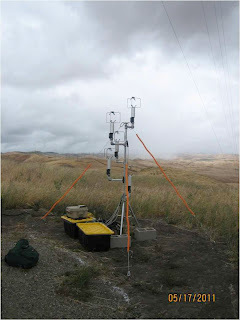 Google used this tool to help evaluate heliostat field layouts and calculate heat input into a CSP receiver for power production. HOpS works by passing "packets" of light between optical elements (the sun, heliostats, and elements of the target surface), tracking shadowing and blocking masks along the way. For our analysis goals, this approach gave our researchers more flexibility and accuracy than analytic tools (such as DELSOL or HFLCAL), and it was easier to set up for thousands of runs than using ray tracers. Output from the simulation includes heliostat efficiency, target irradiance, and more, while an included shell script facilitates plotting heat maps of the output data using gnuplot. The REC_CSP open source project contains data sets and software useful for designing cheaper heliostats. 1. 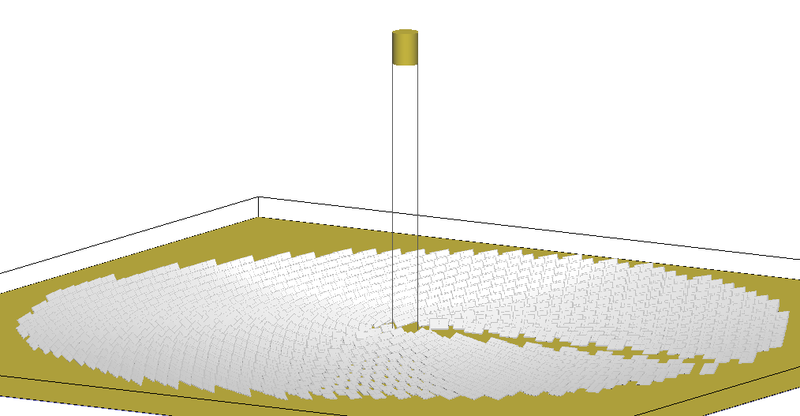 Thirty days of three-dimensional wind measurement data taken with ultrasonic anemometers (sampled at ~7 Hz), recorded at several near surface elevations. 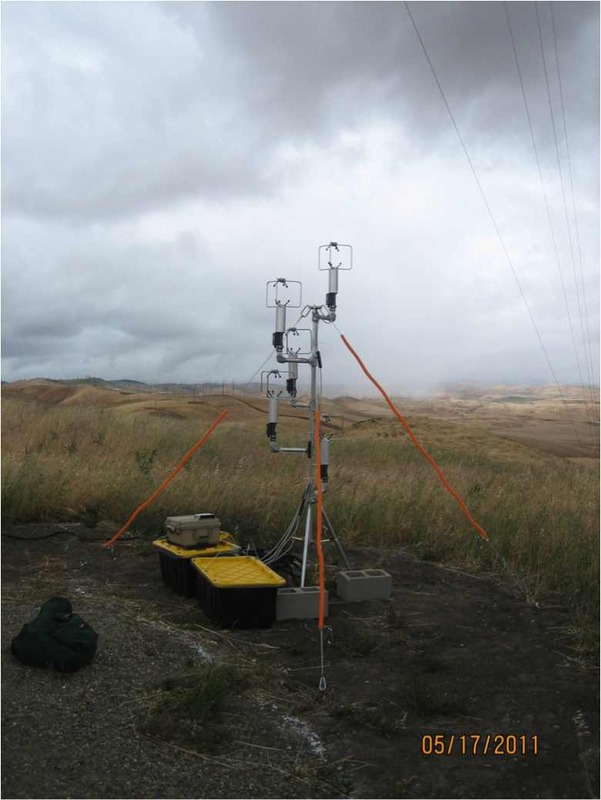 The data is presented in the RE<C wind data collection document and is available for download on the open source site here. 2. 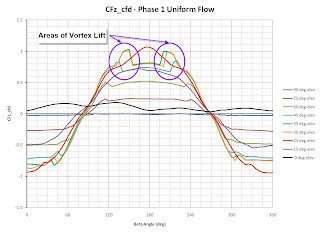 A collection of heliostat aerodynamic load data obtained in a NASA wind tunnel and graphically represented in the appendix. This data is available for download on the open source site here. 3. 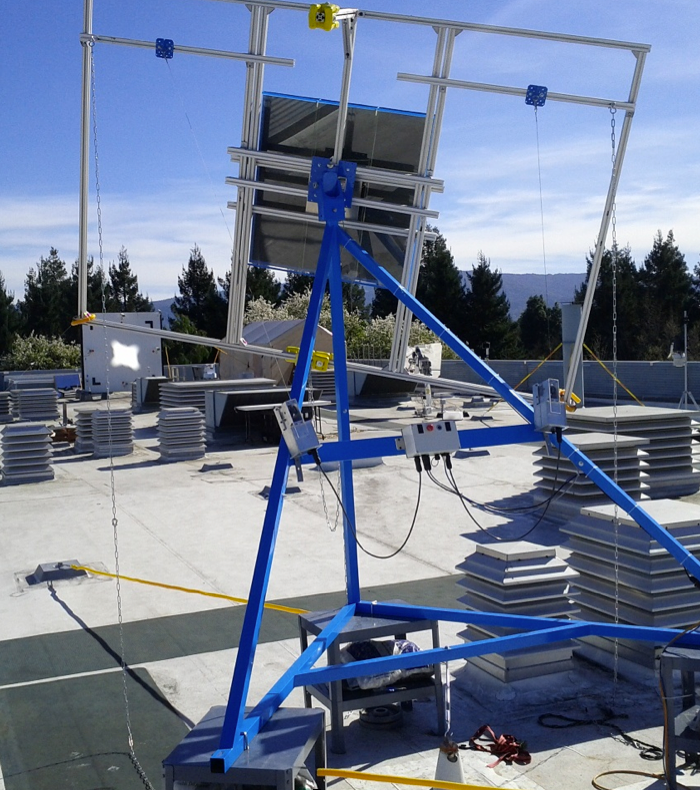 Matlab software for high-precision, on-target heliostat control with built-in simulation for testing. 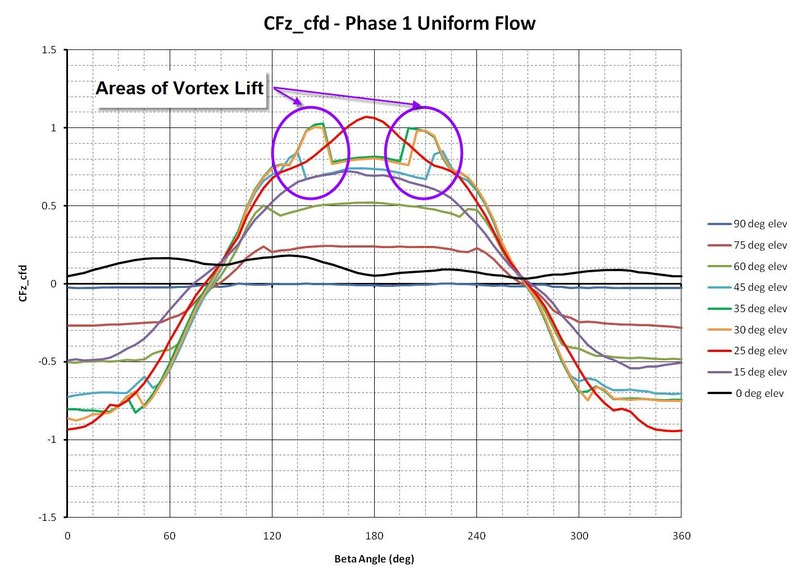 This is essentially the same software used in the RE<C heliostat control demonstrations and described in the accelerometer sensing and control system design documents. The source code is available for download here. In May 2009 we launched Google Sky Map: our “window on the sky” for Android phones. Created by half a dozen Googlers at the Pittsburgh office in our 20% time, the app was designed to show off the amazing capabilities of the sensors in the first generation Android phones. Mostly, however, we wrote it because we love astronomy. And, thanks to Android’s broad reach, we have managed to share this passion with over 20 million Android users as well as with our local community at events such as the Urban Sky Party. Today, we are delighted to announce that we are going to share Sky Map in a different way: we are donating Sky Map to the community. We are collaborating with Carnegie Mellon University in an exciting partnership that will see further development of Sky Map as a series of student projects. Sky Map’s development will now be driven by the students, with Google engineers remaining closely involved as advisors. Additionally, we have open-sourced the app so that other astronomy enthusiasts can take the code and augment it as they wish. Google’s BigQuery Service lets enterprises and developers crunch large-scale data sets quickly. But what if you don’t have a large-scale data set of your own? To help the data-less masses, BigQuery offers several large, public data sets. One of these is the natality data set, which records information about live births in the United States. The data is derived from the Division of Vital Statistics at the Centers for Disease Control and Prevention, which has collected an electronic record of birth statistics since 1969. It is one of the longest-running electronic records in existence. Each row in this database represents a live birth. Using simple queries, you can discover fascinating trends from the last forty years. 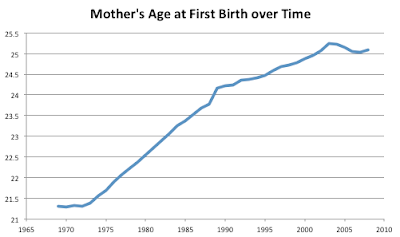 The average age has increased from 21.3 years in 1969 to 25.1 years in 2008. Using more complex queries, one could analyze the factors which have contributed to this increase, i.e. whether it can be explained by changing racial/ethnic composition of the population. You can see more examples like this one on the BigQuery site. In May of this year we launched Google Correlate on Google Labs. This system enables a correlation search between a user-provided time series and millions of time series of Google search traffic. Since our initial launch, we've graduated to Google Trends and we've seen a number of great applications of Correlate in several domains, including economics (consumer spending, unemployment rate and housing inventory), sociology and meteorology. The correspondence of gas prices and search activity for fuel efficient cars was even briefly discussed in a Fox News presidential debate and NPR recently covered correlations related to political commentators. Health has always been an area of particular interest to our team (Matt Mohebbi, Julia Kodysh, Rob Schonberger and Dan Vanderkam). 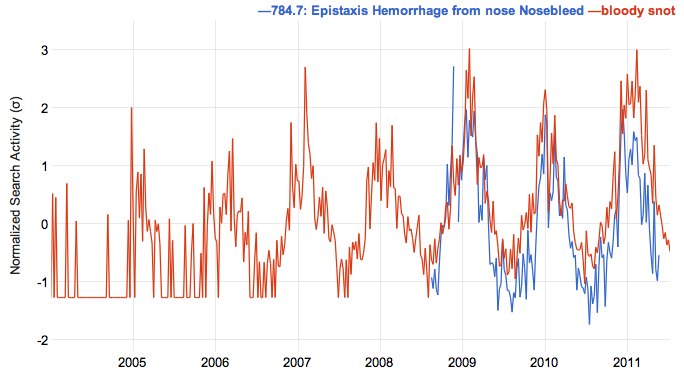 Correlate was inspired by Google Flu Trends and many of us worked on both systems. So we were very excited when the BioSense division at the CDC published a page which shows correlations between some of their national trends in patient diagnosis activity and Google search activity. With just three years of weekly data, relevant search terms are surfaced. 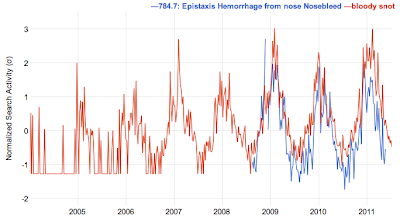 For example, the time series for bloody nose surfaces "bloody snot" and "blood in snot". While these terms shouldn't come as a surprise, there are others which are more interesting, including searches related to static electricity, dry skin, and red cheeks. Of course, correlation is not causation but we hope that Correlate can be used as a method for researchers to generate new hypotheses with their data. To help researchers outside the United States, we're pleased to announce support for 49 additional countries in Google Correlate. It's now possible to see correlations like "snorkeling" in Australia, "cherry blossoms" in Japan , and "beer garden" in Germany. We look forward to seeing what new correlations researchers can find with this data!